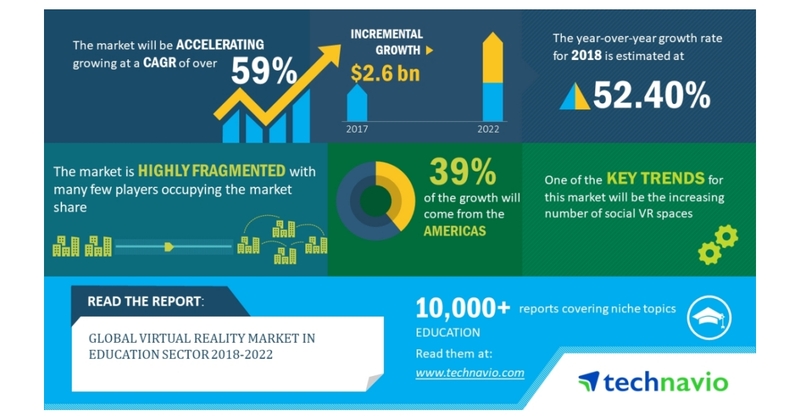 LONDON–(BUSINESS WIRE)–According to the latest market research report released by Technavio, the global virtual reality market in the education sector is expected to accelerate at a CAGR of more than 59% during the forecast period. The increased affordability of VR gear is one of the key factors triggering the growth of the market. This research report titled ‘Global Virtual Reality Market in the Education Sector 2018-2022’ provides an in-depth analysis of the market in terms of revenue and emerging market trends. It also includes an up-to-date analysis and forecasts for various market segments and all geographical regions. In 2017, the VR hardware segment accounted for more than 59% of the global market. The growth of the market can be attributed to the increasing affordability of VR headsets and VR hardware. The increasing number of social VR spaces is an emerging trend in this market space. Considering the criticality of the isolation faced by an individual in a VR and the possibility of developing motion sickness, many VR vendors are increasingly opting for VR spaces. Major vendors such as Microsoft and Facebook are increasingly emphasizing on the incorporation of virtual spaces. Microsoft, through its AltspaceVR, provides various avatars and supports multiplayer sessions that allow the students to socialize and interact with other users. The platform also provides a front row feature wherein the students can be a part of an event or audience and other small groups. Facebook has been continuously developing its own Facebook Spaces VR platform most likely to be released in 2019. It is expected to provide features such as virtual clubs and tutoring options for experiential, collaborative learning.